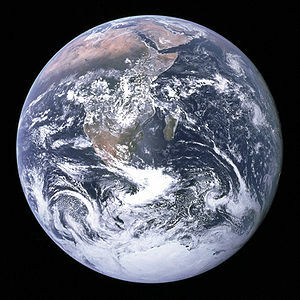 On what mission was the famous "blue marble" photo of Earth taken? The crew of Apollo 17 took the photo on December 7, 1972 at 4:39 a.m. CST, a few hours after launch. The astronauts thought Earth looked like a glass marble, which led to the name. The Blue Marble is probably the most widely distributed image in human history. It was the first clear image of an illuminated face of Earth. The photograph's official NASA designation is AS17-148-22727. It is credited to the entire Apollo 17 crew of Eugene Cernan, Ronald Evans and Jack Schmitt. They all took photos with the on-board Hasselblad. Jack Schmitt probably took the famous image, but that cannot be verified. It was taken with the south at the top of the photo, but was rotated before being released. This was the last time any human has been at a range where taking a whole-Earth photograph such as The Blue Marble would be possible. "View of the Earth as seen by the Apollo 17 crew traveling toward the moon. This translunar coast photograph extends from the Mediterranean Sea area to the Antarctica south polar ice cap. This is the first time the Apollo trajectory made it possible to photograph the south polar ice cap. Note the heavy cloud cover in the Southern Hemisphere. Almost the entire coastline of Africa is clearly visible. The Arabian Peninsula can be seen at the northeastern edge of Africa. The large island off the coast of Africa is Madagascar. The Asian mainland is on the horizon toward the northeast." If you'd like to play future trivia games, you can sign up for the email newsletter and have a chance to win prizes, too. The Cosmosphere is participating in Museum Day on September 25. Sponsored by Smithsonian Media, this is the sixth annual Museum Day. Participating museums across the country open their doors for free to anyone presenting a Museum Day Ticket. As the only Smithsonian Affiliate in Kansas, the Cosmosphere is proud to participate by offering free admission to the Hall of Space Museum on Sept. 25. The Museum Day Ticket provides free admission to the Hall of Space museum for one person, plus a guest. Please note that due to space limitations, other venues at the Cosmosphere; including the Carey Imax Dome Theatre, Dr. Goddard's Lab and the Planetarium, are not part of the free admission. Tickets can be purchased separately for those venues. • Only an official Museum Day ticket is eligible for free entry. Official tickets can be found on the Museum Day website. “Aliens of the Deep” takes you to some of the Earth's deepest, most extreme and unknown environments in search of the strange and alien creatures that live there. 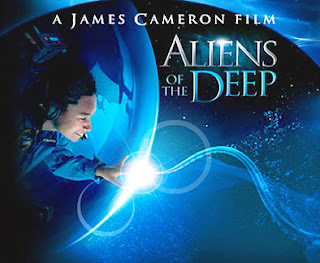 In this James Cameron film you journey to the ocean floor with a team of young NASA scientists and marine biologists who discuss how the unusual life found there may represent what we might encounter in space. It’s the most alien environment to be found on Earth so good training for those who will be traveling beyond the bounds of our atmosphere. “Aliens of the Deep” was filmed during multiple expeditions. Visit underwater volcanic regions and see new ocean floor being created. These hydrothermal vent sites create plumes of super-heated, chemically-charged water where creatures never before seen are flourishing. Six-foot tall worms with blood-red plumes and no stomach, blind white crabs, and a biomass of shrimp capable of "seeing" heat, all compete to find just the right location in the flow of the water. All other life on Earth is dependent on sunlight, but these ecosystems are as close to alien as we’re likely to find on Earth. The environment provides fertile training ground for people destined for space exploration, as they encounter life forms unlike anything they already know. Coffee at the Cosmo on Thursday, September 16, is entitled, “Like an Old Pair of Slippers: Comfortable In-Flight Clothing in Space.” It is at 9 a.m. at the Cosmosphere and is free and open to the public. Astronauts have always had special clothing needs. The iconic spacesuit and helmet they used when walking on the moon would be cumbersome and impractical while travelling in space. From the early years of the space program, astronauts have had “in-flight” garments designed for comfort and ease of use. They have ranged from a modified pair of long underwear used on an early mission, to the jumpsuits, shorts and t-shirts we’re accustomed to seeing on the International Space Station today. During this Coffee at the Cosmo we’ll look at the history of in-flight garments and talk about the challenges presented when trying to keep the astronauts safe and yet allow them to have full range of movement. Coffee at the Cosmo is an ongoing series of free presentations at the Cosmosphere. It’s the third Thursday of every month at 9 a.m. and is always free. Enjoy coffee and pastries, meet new friends, and learn something new. October 21, 2010 "Man on the Moon on the Move: Lunar Rovers"
November 18, 2010 "To Boldly Go Where No Product Has Gone Before: Brand Names in Space"
December 16, 2010 "Barbie Loves Buzz: Space Toys"
The Kansas Cosmosphere and Space Center is a non-profit organization dedicated to enhancing patrons' knowledge of space exploration. Educating people from around the globe, the Cosmosphere boasts the Hall of Space museum, one of the most significant collections of U.S. and Russian space artifacts in the world; the Justice Planetarium, a dome-shaped classroom where attendees learn about astronomy; Dr. Goddard's Lab, a live demonstration of early rocket technology; the Carey IMAX® Dome Theater, one of the first ones built in the world; and summer astronaut training camps. For more information visit cosmo.org.